The AIM NetworkRossleighFair Dinkum, Scott Morrison Turning It Around! Fair Dinkum, Scott Morrison Turning It Around! When you hear that Scottie’s turning it around, most of you immediately think of boats where, as Immigration Minister, Mr Morrison stopped us hearing about all those drownings of the coast of Australia by turning boats around so that they could drown in Indonesian waters. However, he’s recently done something much more miraculous than that: according to various media reports, he’s turned around the fortunes of the Liberal party. Why? Well, that’s the way they covered the latest Newspoll. ScoMo, or more accurately ProMo (kudos to whoever came up with that one!) has apparently turned it all around. Ok, given that the poll after the leadership chaos was so low that announcing that you were putting a banker in charge of implementing the recommendations from the Royal Commission into child abuse because bankers are so trustworthy, probably wouldn’t have caused them to sink any lower. But, hey Scott has turned it all around. He’s fixed the funding wars in Education by appointing Dan Tehan and giving $4.3 billion to the non-government system. It was quite simple really; they just wanted more money. Of course this has led to some asking why the government sector isn’t getting more money. That’s simple. Good education isn’t about more money, it’s about choice. And people who send their kids to Government schools have chosen to do so. If they wanted more spent on their child by the Federal Government, they should have chosen a private school. The money’s been promised to those who educate the children of politicians, the funding wars are over and stop this politics of envy and class warfare. I’m really pleased that structured learning is taking place, but I can’t help but wonder if the camera was a distraction which stopped Tony receiving the direct instruction he so desperately needs. See, there’s another example of Scottie turning things around. Tony, whitesplaining to the indigenous people that they need to learn to speak English. Of course, we can’t have people in remote areas continuing to only speak their native tongue. I’m not sure why. I think it was something about if you’re going to live in this country you’ve got to learn to speak the language that arrived a couple of hundred years ago, not the one you’re ancestors have been speaking for generations. In case you haven’t worked it out, I’m not so sure that Scottie is really turning things around. I mean, the “daggy dad” image that he’s trying so hard to cultivate doesn’t seem to be well thought out. After all, those of you who have a father or uncle like that, probably love him, but when your friends come over or when you spend more than a few hours at home, you suddenly remember why you moved out. You know, after he explains why you shouldn’t go out dressed like that or how your nose ring is probably the reason you’re unemployed and not the fact that your employer just moved his entire operation to the Philipines. I think that while some may feel a bit of empathy for Scottie “Daggie Dad” Morrison, we certainly don’t want him to live with us. And let’s face it, how many of us would like to see our fathers Prime Minister? #I’d like to apologise to any Melbourne supporters who happen to be reading this by mistake because we all know that nobody who barracks for the Demons would be deliberately reading anything on a socialist site like this. Also, I didn’t check the statistics so I don’t know if that suggestion about the Melbourne player is true or not but, in my defence, I was parodying how a Murdoch paper would approach it! the photo of the rabbott and students reminds me of his pitiful attempt to talk to french children at a french school. Be interesting to hear his words in the local Aboriginal languages. Sadly, trumball and his people were so weak that promo was only a toenail away from turning things around. On the other hand how far is billy from turning himself around???? I trust that Bill is FAR from turning himself around. Interesting to note that in recent polls, the government improves its standing WHEN parliament IS NOT sitting. She turned around a lot, I almost asked her if she felt a little dizzy after all that turning, but I didn’t because the daughter gave me a ‘ warning” look… It said ‘do not’..
Scottie must be a bit dizzy too after all that turning things around…? Is the Fixer Pyne retiring, and is Tehan taking on the fixing and sorting…..Minister for Fixing? Abbott is going to help a little and TURN the black people white…. and Scottie has promised to throw a book at naughty Strawberry thieves… The Bible? 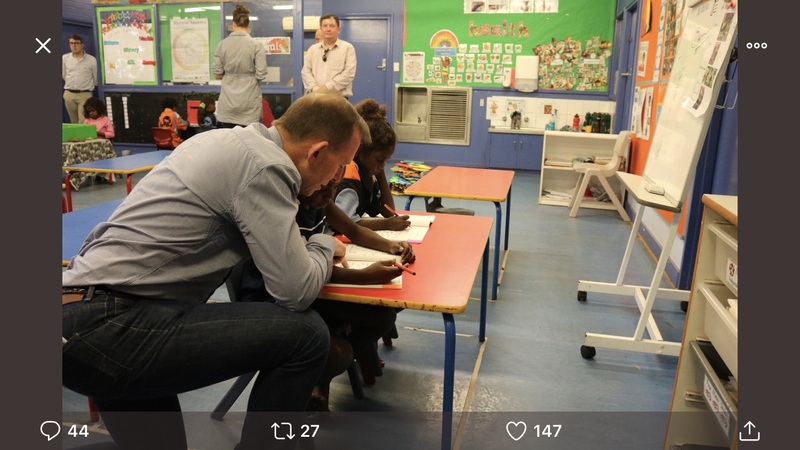 Tony Abbot went to visit the school in Borroloola, NT. He got more than he bargained for and probably not close enough to what he deserves. The reporting on Channel 7 was just like that when that poll was released. I recall cursing about the bias. The bunch of clowns led by the court jester have really turned the recent pension increases around! They managed to introduce a negative increase in Rent Assistance! Makes me wonder about the smoke and mirrors annual budget now! Wow sco m o has turned it all around! How brave & good is this man ? Everything he does or says must be the best thing ever, as he says it! Just think he brought Newspoll figures up from the dismal low they were to where they are just a bit low now! How clever is that? NOT!! Bring on the Federal elections so that all the reasonable thinking people can vote this entire lot of lying scrubbers out, & bring in Labor! Great article, as usual Rossleigh!